A water garden really isn't a "garden" without a plethora of plants; and in most water gardens, there better be ...aquatic plants. The very appearance of the words "water garden" should conjure up a colorful picture of a lushly planted aquatic landscape that's home to fish, frogs and an abundance of other aquatic life. It's probably safe to say that one of the main reasons people enjoy water gardens is the beauty and unique characteristics of the aquatic plants that are a part of them. Now we could start in a variety of places, but the crown jewel of water garden plants across the country is the lily, so that's where we'll start. Lilies are the most popular of all water garden plants. Their ability to spread a multitude of leaves across the surface of the water and flower throughout the season, make them a sought after addition to the pond. Lily pads also provide a great deal of shade from the heat of the summer sun, allowing fish to retreat underneath the shelter of their leaves. And they come in a variety of forms. Beautiful Hardy Lilies: Hardy lilies come in a wide array of colors, shapes, and sizes. They are reliably perennial from the northern reaches of zone 3 to the subtropical areas of zone 11 of the extreme southern United States. Refer to the hardiness zone map to find out which zone you live in before purchasing plants. Each spring, their stems will begin to push the curled up leaves to the surface of the pond. Each floating leaf is cut into two lobes. Lily leaves provide a great deal of shade from the heat of the summer sun, making algae control easier, as well as allowing fish to retreat underneath the shelter of their leaves. The white, pink, red, or yellow flowers are often fragrant and known as the jewels of the water garden as they float on the surface. Hardy lilies typically bloom from May through September. 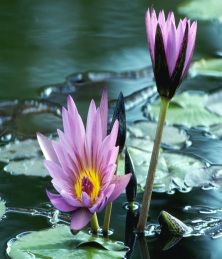 Water lily flowers usually open in the early morning, and close by mid to late afternoon. When cold weather comes, the foliage dies and sinks to the bottom. New leaves will begin to arise from the submerged rhizomes the following spring. Tropical Lilies: Tropical lilies produce vibrant, colorful blooms. The flowers, usually carried above the water surface on strong stems, come in brilliant whites, yellows, pinks, reds, and lilacs. Their leaves also come in an abundance of sizes, shapes, and colors. Tropical lilies, only hardy to zones 10 and 11 can be planted in colder zones when the water temperature is consistently above 70 degrees Fahrenheit. Most tropicals are treated as annuals each year in colder climates. However, they can be brought inside and overwintered if given proper care. Tropical lilies come in two categories, day bloomers and night bloomers. Day blooming tropical lilies bloom in the early morning and close in the afternoon. Night bloomers, however, begin to open in the late afternoon and continue to stay open until early the next morning. Night bloomers are very appealing to pond owners who work by day and enjoy their pond by night. Lotus: Lotus have circular leaves that are held high above the water and flowers that rise above the leaves with fragrant, beautiful blooms of yellow, pink, rose, red, or white. Even their seedpods are interesting, and are commonly used in dried flower arrangements. This is one plant you'll want to keep in a pot, as it is highly aggressive. Nelumbo 'Mrs. Perry Slocum': This free flowering changeable lotus has flowers that are pink, flushed with yellow the first day, pink and yellow the second day, and changing to cream with pink the third day. Recommended for medium to large ponds, it will also grow and bloom in container gardens. Floating Plants: The floating aquatic plants are just that, they float on the water's surface while their roots hang down into the water below trapping sediment and utilizing many excess nutrients. Floating plants can be placed in the pond, but need to be situated out of reach of the skimmer. Tucking floaters into the edges of the pond or in and around lily pads can also help prevent the skimmer from drawing them in. Most water garden plants are fairly easy to grow, so be aware. It doesn't take more than a year or two before even a few plants can crowd a small pond. These are good design points to bring up to potential customers who think they want a small pond. The first stage of planting, or "Aquascaping," a pond should be taken into consideration well before water is added. A little planning during the excavation will help provide plenty of planting areas for water garden plants. Too Small: The ability to vary the widths of the shelves will ultimately depend on the overall size of the water garden. Keep in mind that your creativity will be limited by the width of the shelves, and your ability to provide planting areas, when building a small 4' x 6' pond. So What is a Good Size? The size of our most popular pond, the 11' x 16', doesn't allow you to get too crazy with the width of the shelves. However, it does provide enough space for some interesting designs. Large Scale Ponds: In contrast to smaller ponds, large scale or commercial size water gardens provide extremely large areas along the first few shelves for aquatic plants. For example, a half acre pond provides enough square footage to create wide shelves and large plant pockets. Shelves for marginal plants may be as wide as 15' or more, giving the plants plenty of room to stretch out. Lily pockets may be as big or bigger than an 11' x 16' pond and contain a hundred lilies. Shelf Design on an 11' x 16' Pond: The shelves on 11' x 16' ponds are usually allowed to meander in and out, leaving wider sections dedicated for the placements of the marginal plants. Lily Pockets: The typical 11' x 16' pond may have two or three lily pockets dug into the second shelf. A lily pocket is simply a hole dug into the excavation that serves as a "pot" for the lilies. The lily pockets are approximately 18" wide and 6" to 8" deep. Two or three pockets in an 11' x 16' will provide a healthy coverage of lily pads on the surface of the water. Lily Pockets in Other Areas: Don't feel limited to installing lily pockets on the second shelf only. Lilies have been known to grow in depths up to 15" deep. We take advantage of this by installing lily pockets in deeper portions of the pond. You can even dedicate entire shelves for lily pockets. Proper Excavation for Plants Height of the Shelves: The first and most important step is digging the pond with a series of shelves. Most of Aquascape's ponds consist of the first shelve excavated at a depth of 8" to 10" for marginal plants, and the second shelf from 12" to 18" for lilies and lily-like plants. Fairly simple ...right? The key to excavating the pond for future planting, as well as adding a little personality to the pond, lies in the widths of the shelves. Let us explain. Most literature written about pond construction demonstrates the kidney bean or figure eight pond with a series of shelves. Each shelf is excavated approximately 18" wide throughout the pond. In our eyes, kind of dull, sort of boring. The content of the Pond & Water Garden Resources Website comes from the book Pond Builders Bible everything Aquascape Designs Does Revealed.